In any case, here is an article that I wrote for UT recently. However, due to a surprising lack of response to the subject on social media, it never got published. So I have decided to publish it in full here. Enjoy! 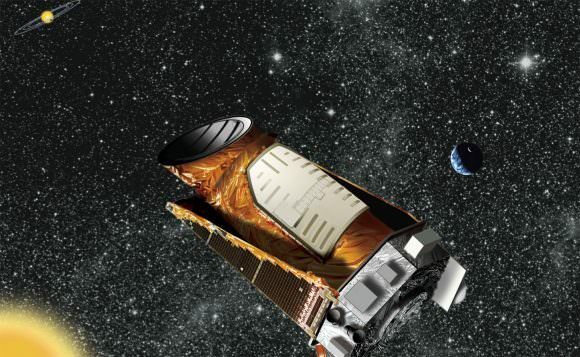 Since it was deployed in March of 2009, the Kepler space telescope has been responsible for the discovery of thousands of potential extrasolar planets (aka. exoplanets). In fact, as of January 2015, Kepler confirmed the existence of 1,013 exoplanets in about 440 stellar systems, along with a further 3,199 unconfirmed planet candidates. This is certainly an impressive feat, especially when you consider the fact that it accounts for almost half of all the exoplanets discovered so far. But earlier today, NASA hosted a news conference in which they declared that Kepler has effectively doubled the number of exoplanets it has discovered. In what is the largest single batch of discoveries to be announced at one time, NASA claimed that the Kepler mission has validated the existence of 1284 new planets with 99% percent certainty (along with 428 likely false positives). Not only is this the largest group of discoveries made by NASA (or any space agency) to date, it doubles the number of planets in the Kepler catalog. As of May 9th, 2016, some 1,041 confirmations had been made. But with this latest addition, that number now stands at a robust 2,325. Quite the accomplishment for a mission that was nearly abandoned due to mechanical failure. Back in 2012, the Kepler mission suffered a setback when one of the spacecraft four reaction wheels – which are used to point the spacecraft – stopped working. This was followed by a second failure in May of 2013, which disabled the collection of science data and threatened to end the mission three years ahead of schedule. After much consideration, NASA declared on August 15th, 2013 that they had given up on attempting to repair the reaction wheels and had instead chosen to modify the mission. By November, NASA reported that Kepler would henceforth be dedicated to searching for habitable planets around smaller red dwarf stars – a mission which they named K2 “Second Light”. This mission extension was approved shortly thereafter, and Kepler has been carrying on with this mission ever since. And with this latest batch of discoveries, Kepler is showing that it is still pulling its weight, and then some! Of those planets confirmed in this latest batch, most fell into the class of “mini-Neptunes” – planets that are the lower limits of a gas giant’s size. The next greatest sample consisted of “super-Earths” – terrestrial planets that are larger than Earth, but significantly less than that of a gas giant. The remainder of those discovered fell between those that were Earth-sized or Neptune-sized gas giants. 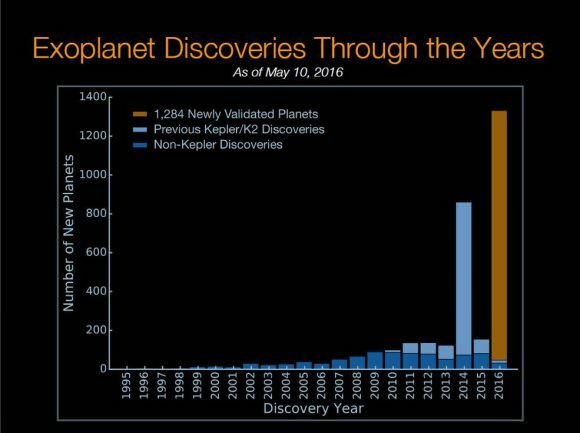 And as was made clear at the NASA-hosted conference, the discovery of over 2000 more confirmed exoplanets will also be of major importance for the next-generation of space telescopes, all of which will picking up where Kepler leaves off. These include missions like the James Webb Telescope, the Transiting Exoplanet Space Survey (TESS), the Wide Field Infrared Survey Telescope (WFIRST), and the ESA’s Plato mission. Much like Kepler, they will be searching for more than just extra-solar planets. Using similar detection methods as Kepler, as well as coronagraphic measurements, these missions will be hunting for more worlds, and assessing their properties to see if they are capable of supporting life. And in the meantime, there is still plenty for Kepler to do before its mission is set to expire (in October of 2016). For example, there are more than 3,000 candidate planets in the Kepler database that need to be confirmed or ruled out. And then there are the “Kepler Objects of Interest”, a list of detections that need to assessed to see if they can even be considered as true candidates. It certainly goes without saying that this latest announcement is also a major step along the road to finding extra-terrestrial life in the Universe. The more planets we find, the greater the odds of finding ET! While it may be naive to assume that they would live under conditions similar to our own, we are looking for the low-hanging fruit first. And finding and studying more exoplanets could also help us to understand what other conditions life might flourish under. The research that led to this announcement was also published today in The Astrophysical Journal under the title “False Positive Probabilities For All Kepler Objects Of Interest: 1284 Newly Validated Planets And 428 Likely False Positives” by Timothy D. Morton (et al.). Son of a – thanks for the catch! Hey, what are friends for, if not to watch out for and help each other out on occasion?